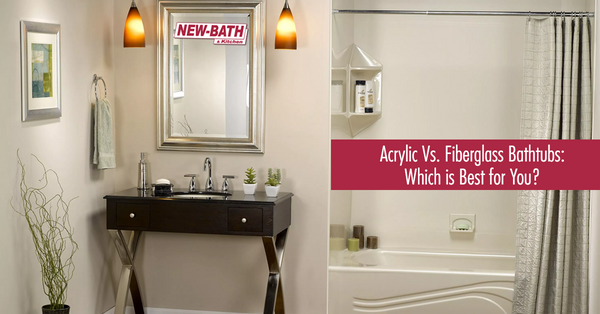 Acrylic Vs. Fiberglass Bathtubs: Which is Best for You? When you’re looking to buy a bathtub you’ll find that both acrylic and fiberglass tubs are inexpensive and won’t break your budget. These two materials are everywhere in the industry. So, how do you choose which material is best for you? We've put together some information below that will help you make your decision and get you into a nice, relaxing tub as soon as possible. Fiberglass reinforced plastic is made from layers of minuscule strings of interwoven glass, heated together. That is then molded, shaped, and sprayed with a resin gel coat. It’s one of the most affordable materials for tubs and one of the easiest to install. This super lightweight material is commonly used in two-story homes because there is no need to install additional support between the bathtub and the floor. Fiberglass tubs have a life span of 10-15 years. Acrylic tubs are colored sheets of clear plastic reinforced with layers of fiberglass. Acrylic tubs are slightly more expensive than a fiberglass tub due to the manufacturing process. They’re also lightweight, very durable, and require less maintenance, unlike other materials. Acrylic is commonly used to form seats, headrests, whirlpool jets and other molding details for tubs. Acrylic bathtubs are very easy to install and have a lifespan of 10-15 years. Acrylic material is heated plastic stretched over a mold. Fiberglass is sprayed with a gel coated mixture over a mold. Bottom line, the acrylic process makes the product more custom and not as manufactured as a fiberglass tub. With an acrylic tub, you can choose between a variety of textures, colors, and fixtures. This can also make these tubs more expensive than fiberglass. Acrylic is much more durable than a fiberglass tub. The chance of an acrylic tub chipping, cracking or fading is unlikely. Fiberglass tubs can fade and get cracked and scratched over time. Both styles can be cleaned with simple cleaning solutions. However, if a fiberglass tub is not cleaned well, the tub will stain, absorb water, and could even grow mold or mildew. What Kind is Right for You? Still have questions? Or are you ready to start shopping? You’re sure to find the help AND the tub you need at Toledo New Bath! Stop in to one of our two conveniently located showrooms. Our dedicated, friendly staff is here to guide you through the whole bathroom remodel progress! Stop in TODAY! With over 40 years of experience, Toledo New Bath will be your first and last stop for all complete bathroom remodeling needs. Get a quote to find out how to remodel your bathroom today!